Rio All-Suite Hotel & Casino offers guests a unique all-suite hotel experience. 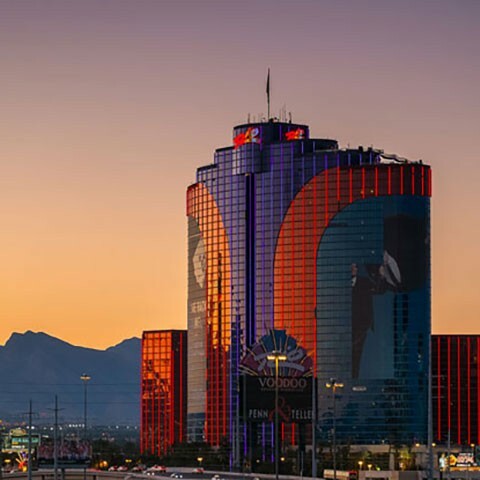 Complete with 2,563 all-suite hotel rooms, the property overlooks the famous Las Vegas Strip. The resort features a variety of entertainment options including headliners Penn and Teller and the world-famous Chippendales. Rio is home to a diverse array of dining and nightlife experiences including, the famous Voodoo Lounge, iBar, KJ Dim Sum and VooDoo Beach. Rio also offers the Rio Secco Golf Club. Recognized by USA Today as one of the “Top 10 Golf Destinations in the World,” Rio Secco Golf Club is an 18-hole championship course designed by famed architect Rees Jones and home to the Butch Harmon School of Golf. Rio Las Vegas features an action-packed, high-energy Las Vegas casino The home of World Series of Poker, it features more than 1,200 video slots along with your favorite Las Vegas table games. You’ll love the masquerade-themed 100,000 square feet of gaming space that includes exciting progressives and the latest themed video reels. We bring excitement to the table with fun Las Vegas table games from Blackjack to Craps, all played on the most thrilling gaming tables in any Las Vegas casino.